2016 marks the 400th anniversary of William Shakespeare’s death, which will be tomorrow, 23rd April. 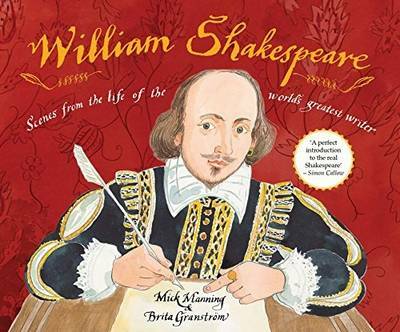 There are a lot of books about Shakespeare and his plays for school-age children, so I thought I’d have a look at books that offer a slightly different format from those we might usually encounter. Manning and Granström have been collaborating for many years and have developed a unique approach to non-fiction by creating what are effectively information picture books. This title on Shakespeare is incredibly detailed both in its artwork and the textual information it provides. 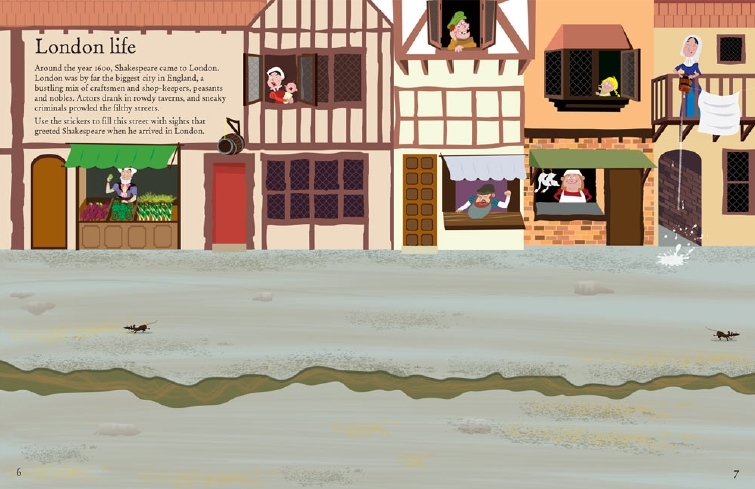 Life in Elizabethan times is depicted vividly, and there is an emphasis on Shakespeare’s life before he became a playwright, which includes quite a bit of social history too. The use of speech bubbles throughout allows the break the text into manageable chunks as well as make the book feel more interactive and engaging. This a book that can be dipped in and out as easily as it can be slowly savoured – the wonderful artwork created using colour pencil and watercolour alone is well worth lingering over, and I was particularly taken by Anne Hathaway’s cottage and The Globe too. It is an excellent introduction to Shakespeare’s world. 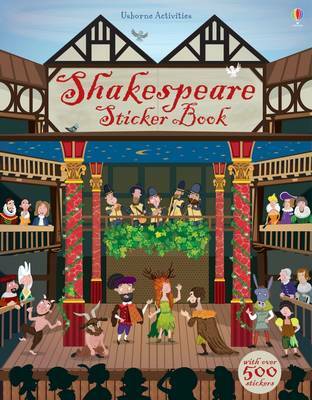 Shakespeare Sticker Book is a ludic and humorous way of introducing Shakespeare and his world to a really young audience. Each double-spread presents a different scene, such as the Globe, or Elizabethan London streets or scenes from individual plays. Each scene is accompanied by a small paragraph describing that specific topic, and it is written in the present tense, which makes it particularly engaging for young audiences. And of course, there are stickers galore! Those stickers, with often over-exaggerated expressions on the characters’ faces, bring a real comical dimension to each scene, keeping it all quite light-hearted (a term not necessarily regularly associated with books on Shakespeare) There are page guides for each set and the process of creating scenes is not only creative and fun, it is also a great way to learn. Classics Unfolded is a really lovely series of books that unfold concertina-style and sum up a classic story in fourteen panels (the book contains sixteen overall). 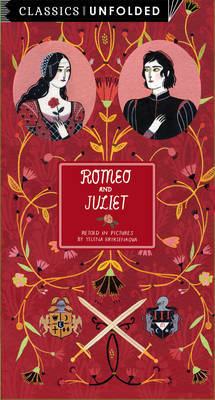 In the case of Romeo and Juliet, there are fourteen key scenes in the play, simplifying it in great visual style. Each key scene includes a quote from the original text as part as the artwork as well as an a short explanation of the action as a caption. Also included is a list of characters, illustrated as a cast list, and a great summary “in 30 seconds” and “in five words”. This is such an ingenious way of presenting classics and making them accessible to all audiences. Its succinct approach is particularly welcome, as is the use of both original and modern text, and has a lot of potential in schools, including secondary school, to use as a first introduction to the play, or indeed as a model for an activity to summarise another Shakespeare play! 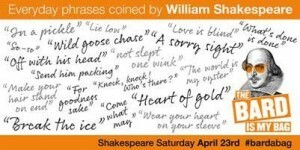 Tomorrow is Shakespeare Saturday and events are taking place across the land in independent bookshops. Participating bookshops are listed here. Why not join in the festivities?